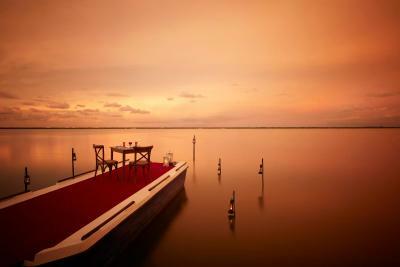 Lock in a great price for Jetwing Lagoon – rated 8.5 by recent guests! The restaurant - wonderful food and great service. The room was amazing. Biggest we have been in in sri lanka, the outdoor-ish toilet was perfect, amenities in the room and hotel was all perfect. 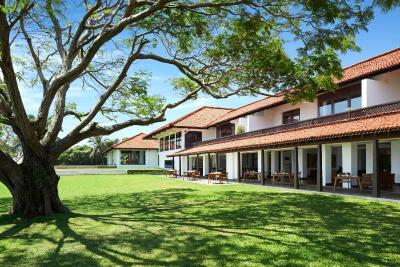 Such a great hotel to unwind after a long trip in sri lanka and close to the airport. Its a bit pricy but worth every penny, The open lobby is a refreshing surprise, swimming pool was just perfect and the staff are all friendly and welcoming. Breakfast and dinner was on spot. Would differently recommend it. 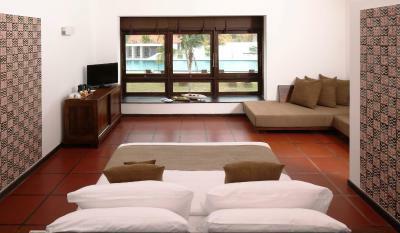 We only stayed one night as stopover at the beginning of our trip through Sri Lanka. 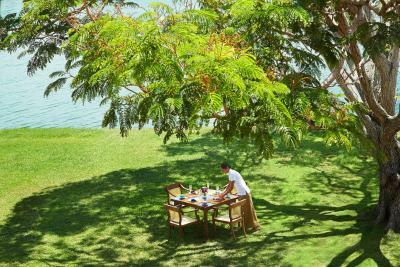 Where the hotel is located is amazing, next to a big lagoon which made the dinner and breakfast views beautiful. 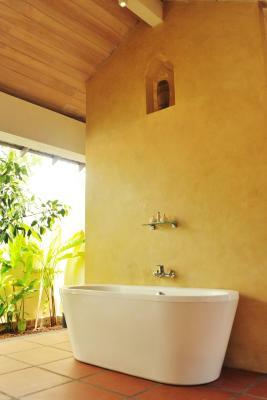 The room was nice, outdoor bathroom including bathtub was cool. Amazing and huge pool !!! Service was great! Bed was really comfortable. This is a place to relax and chill. You can spend all day doing noting but just being there. The facilities are great and the room is amazing. Awesome pool and overall a great experience. 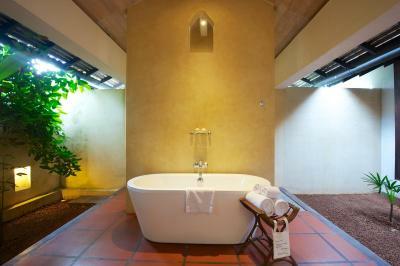 The room was beautiful and The spa was amazing. So relaxing. Would definitely go again. 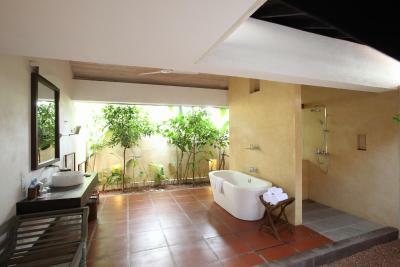 I like that the rooms are very large and the swimming pool is so big. 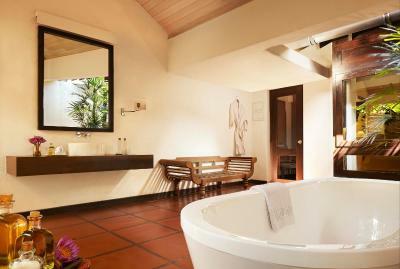 A nice resort that you feel private and the room with the outdoor bathroom is amazing ! 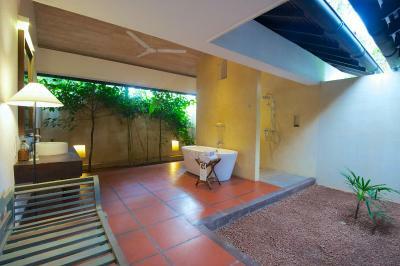 I like the amenities also. The pool is just perfect! Longest in Sri Lanka :) 30 minutes ride from the airport. The staff are very welcoming and helpful ! Jetwing Lagoon This rating is a reflection of how the property compares to the industry standard when it comes to price, facilities and services available. It's based on a self-evaluation by the property. Use this rating to help choose your stay! 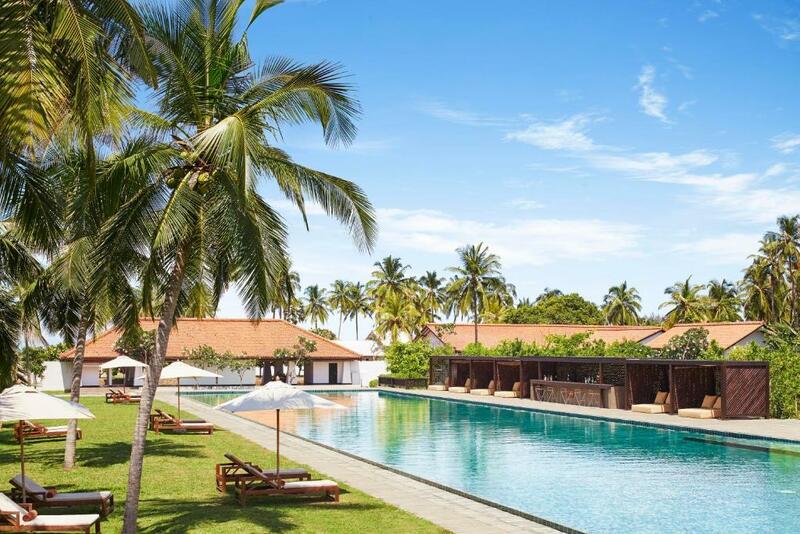 One of our top picks in Negombo.This 5-star resort offers elegant, eco-friendly accommodations with private balconies and bathtubs. 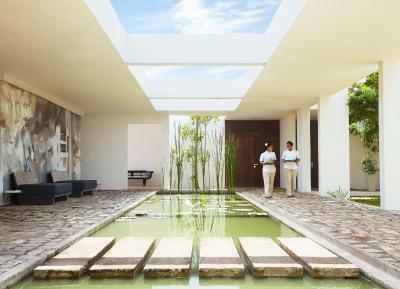 The resort uses solar energy and provides excellent facilities like a 328 foot outdoor pool, 5 dining options including a wine cellar, and a spa. 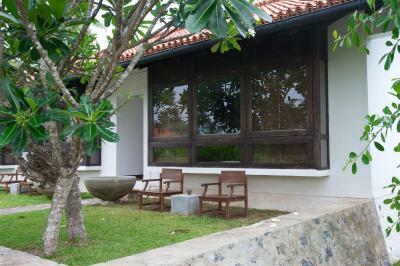 Overlooking a lagoon the property located 4.3 mi from the Negombo City Center. Colombo International Airport is 9.9 mi away. 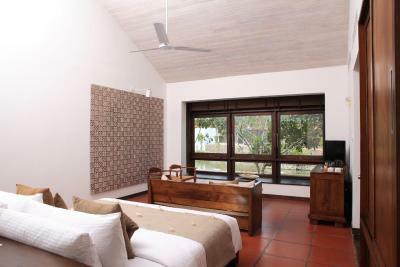 All rooms boast views of the pool or the garden, and feature a spacious seating area and a semi-outdoor bathroom concept. 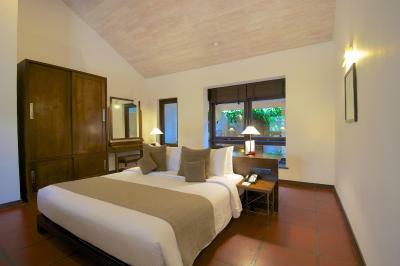 They are equipped with a flat-screen cable TV, a mini-bar and ironing facilities. 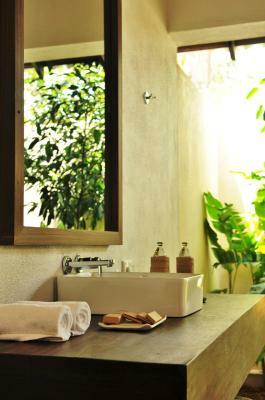 Toiletries, a hairdryer and bathrobes are also provided for guests’ convenience. 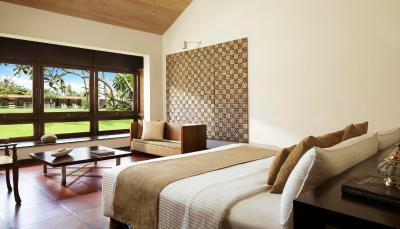 Some rooms overlook the lagoon. Guests can enjoy delicious fine dining meals at the resort’s 3 restaurants or have a memorable dining experience in the cellar. 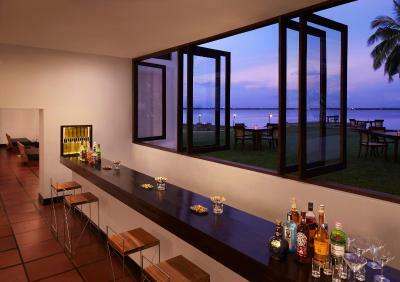 The pool bar serves refreshing cocktails, while the main bar offers light snacks and various beverages. Room service is also available. 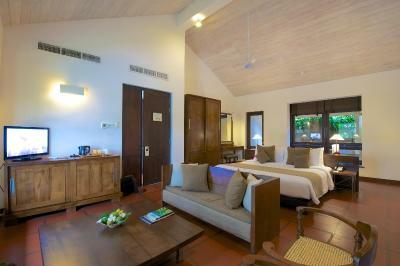 When would you like to stay at Jetwing Lagoon? 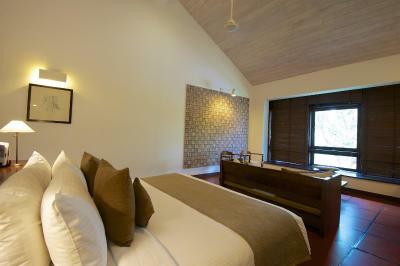 This twin room features a bathrobe, flat-screen TV and mini-bar. House Rules Jetwing Lagoon takes special requests – add in the next step! 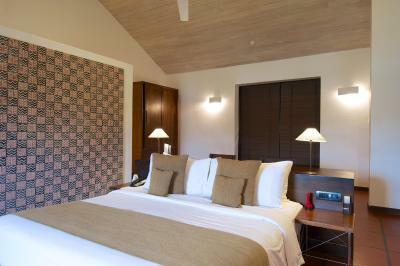 Up to two additional older children or adults are charged 40 % of the room stay per night per person for extra beds. One older child or adult is charged 40 % of the room stay per night and person when using existing beds. Jetwing Lagoon accepts these cards and reserves the right to temporarily hold an amount prior to arrival. Please note that Jetwing Lagoon incorporates the best available technology to reduce its usage of nonrenewable sources of fuel. From biomass boilers to vapor absorption chillers to its own bottled water. If you are a light sleeper consider bringing earplugs, I was woken a few times from the sound of suitcases being wheeled across the cobbled path. Check out is slightly slow as the bellboy has to confirm what you have or haven’t taken from the minibar. 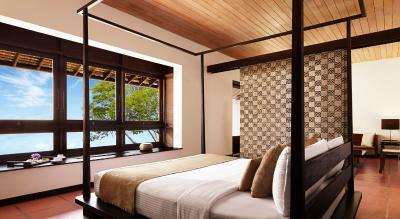 This is a great hotel designed by the one and only Geoffrey Bawa and is located 40 mins drive from the airport. The room is comfortable albeit slightly dog eared. 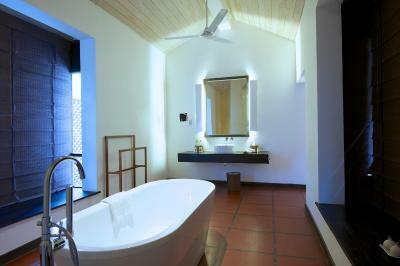 The bathroom is huge and beautifully designed once again well done Geoff! Pictures don’t really do justice to the 100m pool. It was a delight to swim and float around in it. 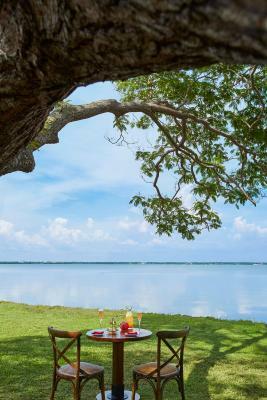 The breakfast offered is tasty and the view over the lagoon is stunning. We had an early flight to catch and watched a beautiful sunrise. 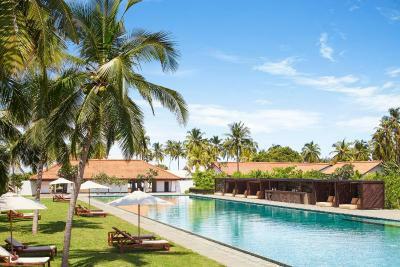 This is a decent hotel but you only need to spend 1 night here either at the start or end of your Sri Lankan holiday. The property felt a little tired and in need of refreshing. Apart from the resort there is nothing for a tourist in the vicinity. And although you can see the airport on the other side of the lagoon, it takes longer to get there than from Jetwing Beach. The pool was great and the views over the lagoon were lovely. There was a fantastic breakfast buffet and we liked having the opportunity of trying different Sri Lankan delicacies. Air conditioning didn't work properly so we spent a very uncomfortable night. 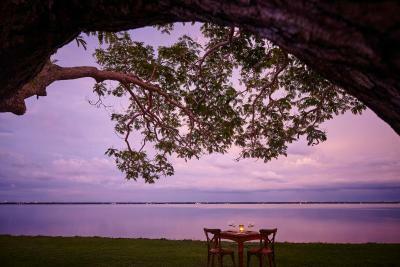 Location next to lagoon and al-fresco bathrooms results in high risk of mosquito bites. Food was OK, but nothing special. Water in swimming pool looked milky and I picked up an ear infection after swimming in it. 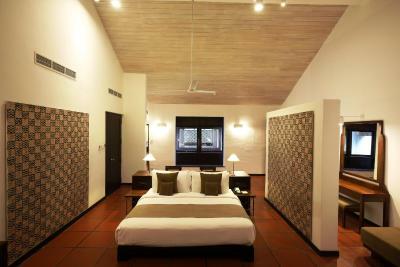 Since I like Geoffery Bawa Architecutre, Staying at his hotel was my main destation of Colombo visit. I loved every single points. space layout, guardening, lagoon side restaurant etc. a great experience. Nigombo is near from International Airport which was also comvenient for me. We booked a room at Jetwing Lagoon after a long flight from Europe. We wanted to have a good rest and told the staff so. We were however rudely awakened by a member of staff a few hours later for no valid reason at all. The food at the restaurant took over half and hour to arrive. While the managers were apologetic, no real action/gesture was taken. 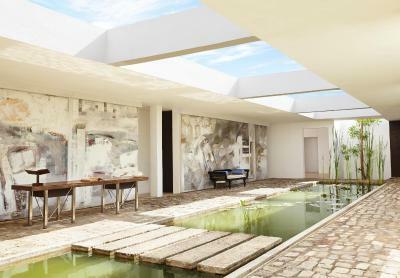 The pool is very nice and the building airy. Everyone at the hotel was extremely friendly, warm and hospitable. The General manager was attentive and open to our only small reservation that there was not sufficient variety for vegan guests. He immediately undertook to augment the training of his restaurant stalk and kitchen accordingly. That said this hotel its location and quality of care is exceptional. 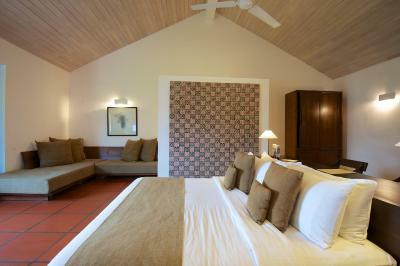 Spacious, very tasteful rooms. Very friendly and attentive staff.